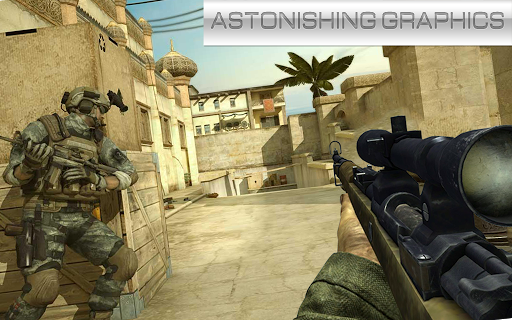 #1 first person shooter game that will blown you away! 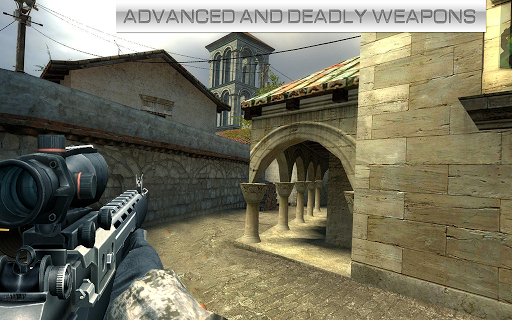 You play as a sniper assassin STORM the barracks , Kill the Military Leader. A very fascinating 3D FPS shooting game, Real battle scenes, super firepower, enjoy the thrill of shooting down enemy & their aircrafts. Eliminate the mafia from the streets of city. Become the best shooter of the town. Play with the latest weapons. Pull the trigger and eliminate the terrorists from your territory. Kill all the evil forces in the region and spread your name in the area. Become the Elite Sniper Shooter of the town. Kill all the Contract Killers and get your self at top like a Boss. Become a Boss Sniper Contractor. Aim The Target & Take Best Head Shot! * M82 Barrett .50 Cal. * L115A3 AWM (Arctic Warfare Magnum). * Dragunov SVD (Soviet Union). * M21 Sniper Weapon System (SWS). Kill all the enemies with auto & semi-auto guns. Some Jet Fighters like F16, F18, Cobra Helicopters, Machine Guns, Roof Top Snipers, Tanks, Grenades, Gorilla Forces & Commando’s will try to destroy your base. Eliminate the small group of terrorists early in the game before they call all of these backup forces. Eliminate ISIS terrorists from the area. Win this Combat. War is at it’s peak. Save this city from the devil. Hold your breath & Pull the sniper trigger in this real-life 3D graphics and sounds environment, the game gives an exhilarating experience to complete this mission. The game has two beautiful screen map: Military Base and the City. Military Base gathered a large number of terrorists, extremely dangerous. Guarding a prison isn’t the only job now, as the lead of the sniper squad control the security of the city and prison. Provide cover to your Army on the border and to Police in special Forces Mission. Be the part of Squad. – Boasting spectacular graphics and blistering action sequences. – Real life sound effects. – 30+ real world weapons. – Local Mission mode & online PvP mode. – Try intuitively easy controls – SWIPE, ZOOM, KILL. – Ally with your friends and create an UNSTOPPABLE SQUAD. 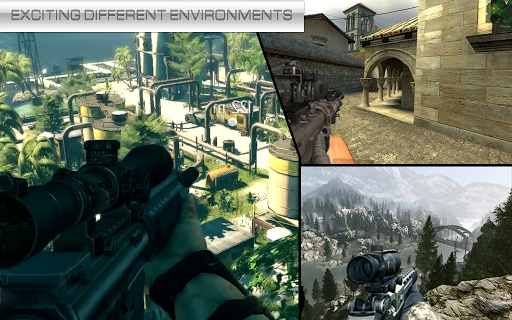 With other elite swat sniper force, infiltrate a mob of evil syndicates and high-profile targets. City is on fire. If you like fighting games, you will love the cool Sniper 3D game. Use your limited ammo wisely and kill the insane enemies at a distance before they get a chance to aim at you. You can use the sniper rifle zoom lens, adjust the amplification factor by the right side of the slider. Be careful of the enemies hiding behind Monster Trucks, City Buildings Roof Top & in the Trunk of a Garbage Truck. Eliminate the City Building Snipers. When you are in hilly area then be careful of Mountain Snipers. In the desert you might face Desert Snipers hiding in the Sand. In Glaciers you may come across Snow Mountain Snipers. In the Jungle their might be some Jungle Snipers hiding behind the trees or bushes. Some Navy Gunners forces may give you tough time on the ships during the war. Be careful of the attack. Attack your enemies before they attack you. Don’t give them a chance. Make them surrender and unlock new ammo.